Diamonds. Pearls. Rings. Considered fine jewelry, these are all items that are purchased or gifted by many regardless of age group – yes, even watches. According to Scarborough data, 93% of adults 18+ purchased fine jewelry in the past year. Like other industries, the jewelry industry is experiencing changes in how consumers shop for fine jewelry. 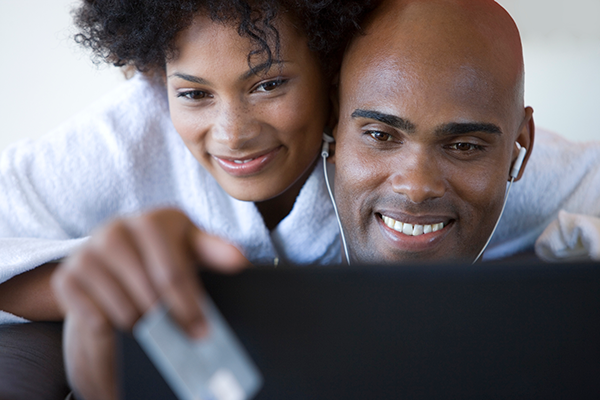 Technology allows consumers to self-educate and research via various platforms and technologies. While national jewelry retailers are an important source for fine jewelry purchases, local stores and department stores are tied as the second most-used locations, according to National Jeweler. At the 2018 JCK Show, the JCK News Director presented the need for jewelry retailers to adjust to the new ways consumers shop. In fact, he reported that “81% of consumers search online to research big ticket purchases but less than 10% actually buy their jewelry online.” The best way to drive search for where to buy these fine pieces locally is radio. 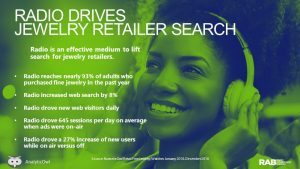 In an analysis of over 21,000 jewelry retailer ads over a 12-month period, radio drove an 8% lift in search activity with over 25,000 new search sessions. Based on NumericOwl data (powered by AnalyticOwl), on-air activity generated 645 sessions per day compared to 513 when radio was off-air. During the on-air campaign, radio drove a 27% increase in new web visitors compared to when the campaign was off-air. Additionally, an average of 1.2 new visitors went to the retailer sites – a substantial lift considering a fine jewelry purchase is not a daily occurrence. When it came to days of the week, Mondays experienced the greatest lift in search activity – 15% greater than search on Saturdays. Tuesdays were an immediate close second. Midday and evening delivered the highest number of new visitors, equally. A presentation is available for download here.